The usually magical Loy Krathong in Pattaya sparkled a little less this year, with rain and a fireworks ban keeping many revelers away. The annual water festival, often called the Valentine’s Day of Thailand, still attracted plenty of lovebirds and eager tourists, who not only came to beaches and lakes to float creations of banana leaves, flowers, incense and candles, but to hotels and tourist attractions hosting private celebrations. Among those throwing early Loy Krathong parties this year were the Nong Nooch Tropical Garden and Pattaya Floating Market. 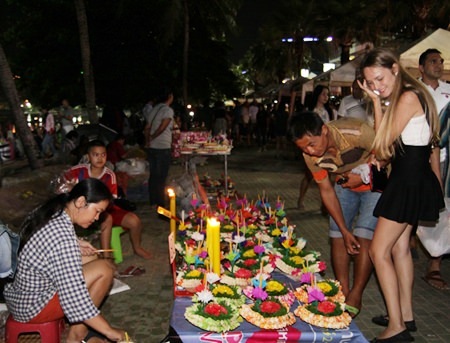 Both locations held their Loy Krathong activities on Nov. 24, a day before the official celebration. Floating a Krathong is like throwing away all of your bad memories and asking forgiveness from the bad things that happened in the past. After dark Nov. 25, it was apparent many tourists stayed away from the beach, due to the rain. Young Krathong floaters didn’t appear until about 10 p.m. Pattaya Beach had a good number of people when the rain stopped, but Jomtien Beach was described as “dead” as many people preferred to stay home or join the official Pattaya City activities at Lan Po Public Park in Naklua. The other factors causing Loy Krathong to lack the usual pop were the bans on fireworks, flying “yi-peng” lanterns, alcohol at organized events and krathongs not made of natural materials. A heart-stopping traditional Khon performance rouses the Loy Krathong audience in Naklua. Pattaya authorities roamed the beach to enforce the rules this year. Tourism Authority of Thailand Pattaya office director Suladda Sarutilavan insisted that, despite the negative factors, turnout for the evening was not bad. Pattaya’s official holiday celebration at Lan Po Public Park saw Mayor Itthiphol Kunplome act as emcee. 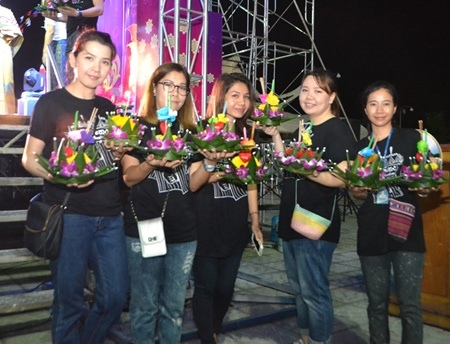 The highlights of the evening activities included a country music concert, a competition of the best-looking Krathong and the Noo Noy Noppamas beauty contest. 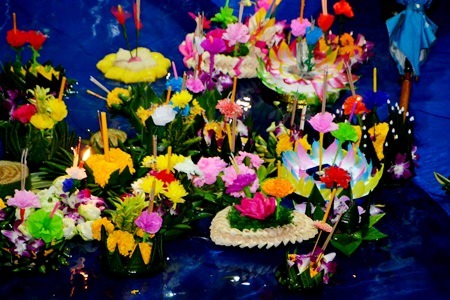 Residents and tourists at the main stage area (Lan Pho Market) prepare to loy their krathongs. 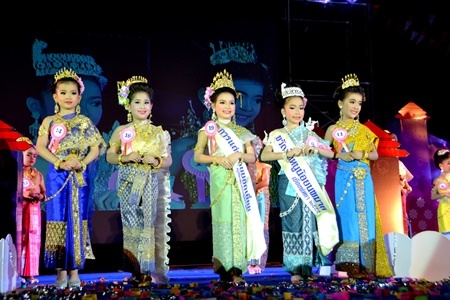 People dressed in traditional Thai outfits were nominated to receive prizes as well. Also, authorities organized a 5×10-meter space in Naklua Bay for residents to float their Krathongs while they asked for forgiveness of the past and move on with a bright future. The Noo Noy Noppamas pageant consisted of 20 young girls from the local schools who battled to the last five. Students from Pattaya School 9 steal the audiences’ hearts with their beautiful performance. The winner was Patranit Kithiworawutinan, 7, who took home 10,000 baht and a trophy. Second place was half-Thai Cindy Smith, 7, who won 7,000 baht. Alisa Petchrath took third and 5,000 baht. Taza Lee Wongaksorn placed fourth, and Natnaree Nopakij was fifth. 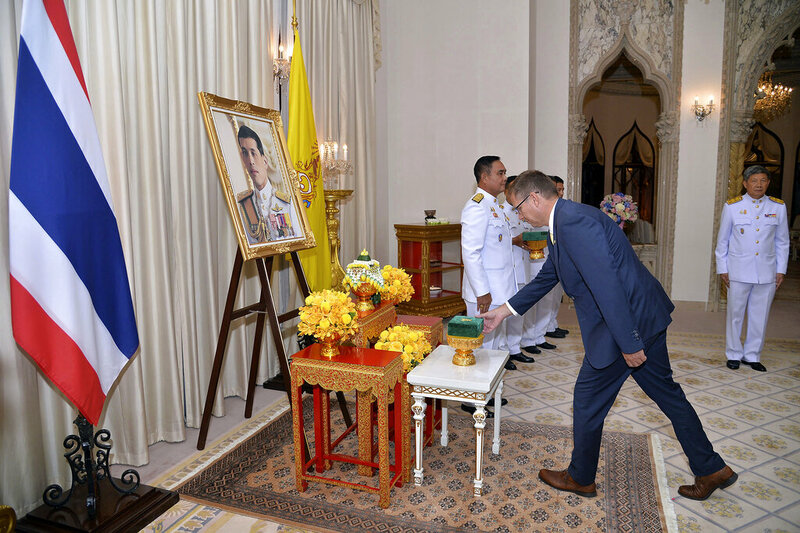 In Sattahip, the official celebration at Luang Chumphon Garden was opened by Vice Adm Wipak Noyjinda, commander at the Sattahip Naval Base, and Noraset Sritapatso, Sattahip district chief. The semi-final 5 contestants in Naklua’s Noo Noy Noppamas Beauty Contest 2015. The abbot of Wat Sattahip Temple led a religious ceremony as residents joined in worship before floating their krathongs. 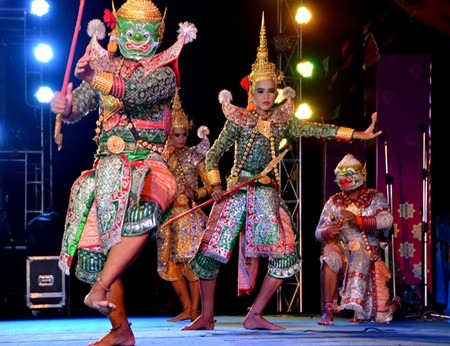 This year, Sattahip also held stage activities, including the Noo Noy Noppamas Beauty Contest, Krathong Contest and more. Mayor Itthiphol Kunplome floats his krathong, floating away his worries. 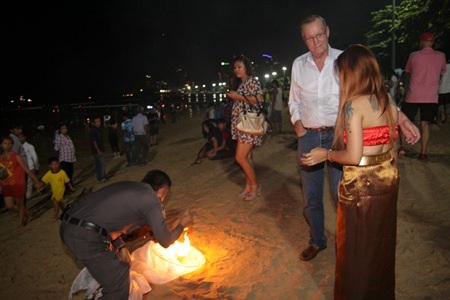 Young love – this pair floats their krathong from Pattaya Beach. Don’t yet have your krathong? No worries, krathongs made of natural materials were for sale all along Pattaya Beach and in other popular spots. The police were adamant in enforcing the “no floating lanterns law” this year, officer shown here putting out the fire.